In southern cities like Austin, Texas, mold peaks during the summer when there is a large amount of rain, followed by hot and humid days, creating ideal conditions for mold to grow and spread. When mold appears in your commercial building, you want to act quickly and have it removed to ensure the quality of your building as well as the safety and health of the people who work there. Mold remediation consists of not only repairing the moisture issue at its source while protecting yourself and others in the area, but also making a mold prevention plan to avoid future mold issues. In moderate to severe cases of mold, it is recommended to hire a professional mold removal service that will have the proper equipment and knowledge to safely remedy the situation. Clean up steps for mold remediation is a small process, so make sure you invest in the proper clothing and equipment. Repair the moisture Issue. Mold feeds off moisture that accumulates on cardboard, drywall, paper, ceiling tiles, dust, wood products, insulation, carpet, fabric, upholstery, and around leaks in roofs, pipes, or windows. Water damage from rain, melted snow, improperly vented appliances, or burst pipes are just a few examples of how moisture can enter your building and cause mold growth. Pinpoint the source of the moisture and repair the issue first. This will cut off the source for future mold spore growth and make cleaning up easier. Seal up the contaminated area. If you are in a multi-level building, close all doors and entrances to the mold affected room or floor. Use thick sheets of plastic to cover all openings and seal the sheets with duct tape to prevent mold spores from spreading during the cleaning process. Prevent mold spores and dust from escaping. Lightly mist the area, especially dried mold, with water to lessen the chance of mold spores becoming airborne. Remove and discard all moldy and wet materials in the area. Follow the Environmental Protection Agency’s guidelines for mold removal in commercial buildings to safely discard the appropriate materials. Discard porous materials that can’t be cleaned like wood, paper, and insulation. Use heavy duty plastic bags. Throw away all of your materials in plastic bags at least 6mm thick. Double-bag if you feel like the materials are at risk of tearing the plastic. Tightly knot the bags, wiping down the outsides with an antibacterial solution before bringing them to a trash bin in an outdoor location. Remove the remaining mold. Use a wire brush or disposable wipes to remove the mold from any non-porous or salvageable surface. Clean the area using a soap and warm water solution. Make sure to dispose of any mold and your equipment in heavy duty plastic bags, following the above steps. Disinfect the area. Once the mold has been removed, wipe down the area with a disinfecting solution with a damp cloth or mop. In more severe cases, a HEPA vacuum might need to be used on all surfaces prior to disinfecting. Discard the cloth or mop head as detailed above. Inspect the area. Thoroughly go over the entire area to make sure there is no mold, dust, dirt, or debris left behind. Having a clean area will prevent new mold growth. Dry the area. All of the surfaces should be wiped down and dried. Moisture is the starting point for mold growth, so maintaining a dry area will prevent that. Repair the area. Any materials or surfaces that were discarded or damaged in the process should be repaired or replaced. This is the time to permanently fix and prevent any future moisture or humidity problems, complete the mold remediation process. Needing emergency mold removal in the Austin area? Blackhill can provide you with a mold estimate for mold removal and mold remediation services. With more rain and higher temperatures in Texas than previous years, mold spores are at their highest counts. 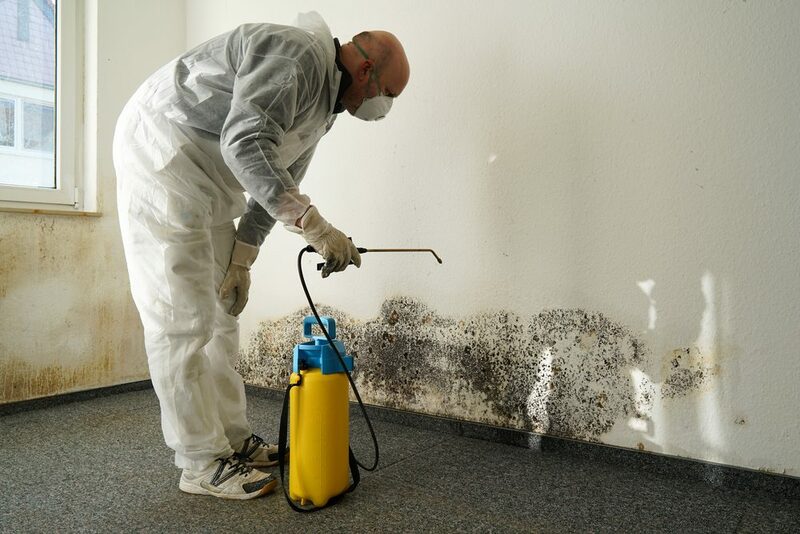 Blackhill Restoration has IICRC Mold Certified Estimators that can quickly perform a mold inspection in your commercial building, assess your issues and determine the cause of your mold growth. We are a first response, emergency services restoration team that is here to help when the need arises. Blackhill specializes in both commercial restoration services and residential home restoration services and repairs in the Austin, Temple, Belton, Killeen, Bryan, College Station, Waco, San Antonio, and surrounding Texas areas. 0 Comments on "10 Steps for Mold Removal in the Workplace"